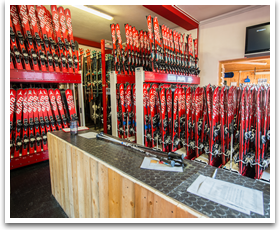 Exclusively for the use of Interski clients, we stock and run our own equipment hire in Courmayeur and Pila. We have invested enormously in our own purpose-built equipment hire centres, employing skilled technicians and masses of top quality Atomic equipment. 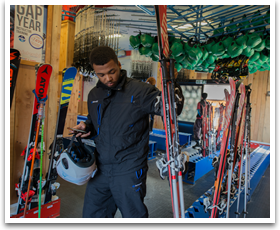 Both of our equipment hire centres are located in the most convenient of places, either right on the slopes or next to the main lift, which means you do not need to carry your equipment any significant distance. Our Pila ski hire building is also our Italian HQ. 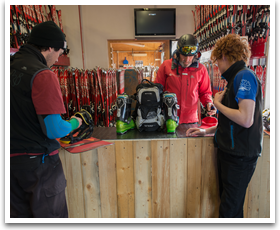 The building features an extensive ski and boot hire as well as a workshop, to make sure all skis we offer are serviced and provided in the best possible condition. The building is located on the other side of the car park and just a very short walk from the main Pila gondola. Our ski hire in Courmayeur could not be in a more convenient location, right on the side of slopes. Located just a short walk from the main lifts, being on the side of the slopes means you have to carry your equipment no further than the front door! Whilst we are always on the lookout for suitable premises, we continue to use our preferred local supplier - Only Ski. We have been working with Only Ski since we first began using La Thuile back in the early nineties. Only Ski is located within the Planibel complex, right at the foot of the ski area, and so benefits our clients with the exact same convenience as our other resorts. Unfortunately, we are only able to offer our superb equipment hire to our own clients. If you would like to take advantage of this superb convenience and great value, why not book your ski holiday with us? Simply visit our ski holiday search page to check prices and availability or give us a call on 01623 456333.